Breaking many records and speeding up at the velocity of sound, the quintet, ViViD will change the world! After that, like being drawn by a magnet, Reno(guitar) who always sticks with the guitar and practices in every moment when he has a chance,　Ryoga(guitar) who is called “the Jack-knife of Kita-Kanto(the center part of Japan, to the north of Tokyo)” from his looks but actually sleeps in every moment when he has a chance, and Shin(vocal) who has the natural innocence of a fool as well as extraordinaire talent as the vocalist and inborn good appearance, joined the two. Instantly five guys hit it off with one another. 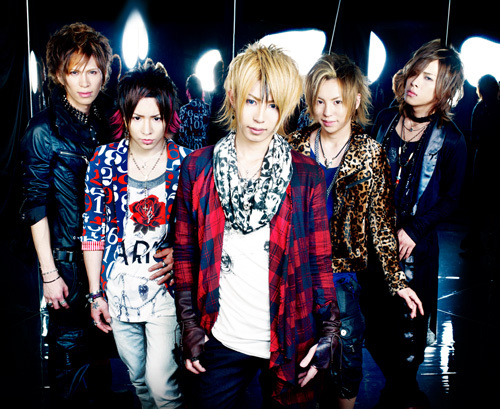 Holding up “Melodic Mixture Rock” as their band concept, they decided to call themselves “ViViD” which represented their wish to keep shining by utilizing each one’s individuality. In April, they performed the first show at Takadanobaba AREA, the venue which was considered as the gateway to success for the “Visual-kei” bands. On July 8th, they released the debut single ”Take-off” from the independent label, which entered the independent chart at No.2. After that, all three singles which they released in a row debuted at No.1 on the Indie chart. On November 7th, they performed the 1st headline show called “THE ViViD COLOR”(sold out) at Shibuya 0-West(capacity of 600), and on March 30th 2010, 2nd headline show called “SIGNET TO THE FUTURE”(sold out) at Ebisu Liquidroom(capacity of 800). In July, they were invited to the biggest Japanese cultural event “JAPAN EXPO 2010” which took place in Paris, France even though they had not debuted in France yet, performed in front of the audience of 10,000 who came from all over Europe and stole the show. After coming back to Japan, the single “PRECIOUS” released on July 7th entered the Oricon Major Chart(National Chart in Japan) at No.15. In August, they announced the forthcoming major label debut at SHIBUYA-AX(capacity of 1400), the 3rd headline show called “DAY OF AWAKING”. The tickets for the last headline show as the indie band, called “KO-SAI GENESIS” at Shibuya C. C. Lemon Hall(capacity of 1800) on December 27th which was announced at the same show, were all sold out within one hour. The calls for their tickets have been getting bigger and bigger in a very short period of time.